Ten years of styling and personal shopping for clients has allowed me to learn and build a knowledge bank to better guide the fashionably hindered. To this day my favourite clients to dress, are pregnant women. 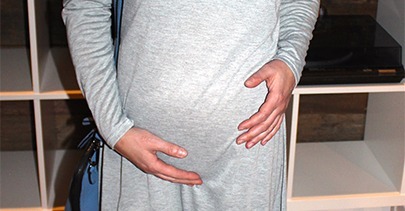 I gained reasonable credibility after dressing my own belly bump and for being the pregnant stylist who thought outside the "maternity world" box, so to speak. I managed to nail down a few tips and tricks to help alleviate the pressures of getting stylishly (while still comfortably) dressed in the mornings. My clients ranged from women who loved to show off their belly bump and women who were more conservative and preferred to always look professional. The one thing we all had in common was to never, ever, under any circumstances, feel uncomfortable. That is why so many companies have profited from selling maternity clothes. Pants that have special waistlines, tops that are longer and cover your growing belly and bottom, special undergarments and even maternity footwear. One of the biggest obstacles I had to help my clients overcome was how to navigate through the possible “scams” and only select necessities. After all, you aren't pregnant forever. Yes it needs to be long and fully cover that bump for the entirety of your pregnancy. Let it hold you close like warm set of muscular arms ;) It's an essential item that will provide comfort and prevent sweaters, blouses and t-shirts from rising up and exposing your belly. A little kept secret of mine was to shop for camisole dresses or slips that basically functioned as long tanks for the last trimester but were super versatile before and after the big bump stage. This was my go-to for 95% of my outfits. I wore it with denim, leggings, slim dress pants, and before my belly was even showing, this was an easy mini dress for Spring/Summer---if you're tall, wear it with cute shorts underneath. I always opted for tunics or dress shirts with collars because the styling options were endless. In the winter you could wear a light cropped knit over the shirt as a fun layered look. In the Fall or Spring you could juge it up by adding a ribbon around the collar to make a bow, a short statement necklace under the collar for a pop of bling, or roll up the sleeves for a casual look. Short or long-sleeved doesn’t matter, as long as it's cotton. When I designed the Nickie, I decided to play with the length and make it A-Symmetrical for a cooler and more interesting look. This will easily take you through all stages of your pregnancy and it's the furthest thing from a "maternity style dress". The drop sleeves are flattering for all chest sizes and shapes too. Wear it with a blazer, leather moto or denim jacket. Dress it up with booties or go for a walk in your Nike Free kicks---this will be your bread and butter all year! Here’s the deal, I tried the "band" on myself and on my clients and it was OK for a month or two but when we get to the waddling stage and the button on our jeans are rubbing on our skin, I would rather walk around in the buff. 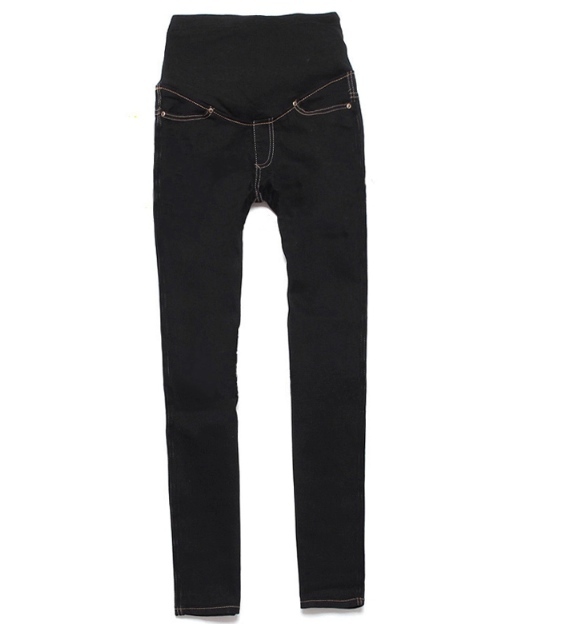 A nice medium wash denim for under $60 like our Jolene’s is the easiest investment you’ll make. 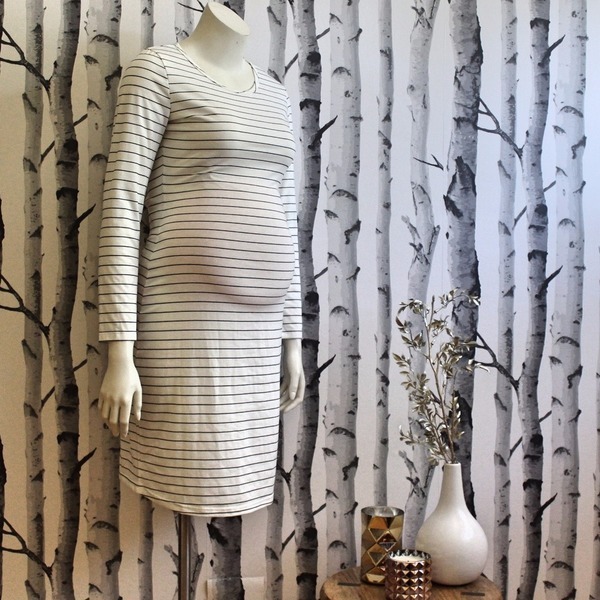 You will wear it postpartum undoubtedly because you will love them so much! Get your closet ready BEFORE you wake up one day and realize you have finally “popped” and nothing fits! This will certainly relieve part of the frustration of dressing your new bod. Stock up on the necessities and if you decide to add seasonal/trendy pieces to satisfy your fashionista taste buds, at least make choices that will carry you through post-preggo and beyond. Enjoy dressing your belly and have fun with fashion! Check out Part Two and Three of Stylish While Preggo next week!